Aloha! My name is Dr. Danielle Dewey. I grew up on farm in Bedminster New Jersey, and moved to Maui from New York City in 2005 with my husband Coe Huston and our Scottish Terrier Lily. We have added to our family since moving to Maui – our son Max was born here in 2007 and we adopted a Cavalier King Charles Spaniel named Ellie in 2010. My Veterinary training began at Ross University School of Veterinary Medicine on St. Kitts in the West Indies, followed by a senior clinical year at North Carolina State School of Veterinary Medicine in Raleigh. I was then awarded a one-year internship in medicine and surgery at The Animal Medical Center in New York City one of the largest and most advanced Animal Medical Centers in the country. I graduated in 2002 and continued practicing in New York City, first at a small dog and cat practice in Manhattan’s upper east side, and then at a larger 10 doctor practice in Park Slope Brooklyn. Practicing veterinary medicine in New York City was the perfect place to start my career. There were so many animals and amazing referral resources that I was constantly learning and being challenged. 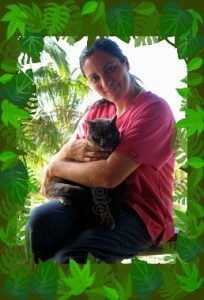 When I arrived on Maui I continued practicing in Kihei and Kahului until 2008 when I struck out on my own and started At Home Mobile Veterinary Services, the only small animal mobile service on the island. Our mission is to provide a personalized and caring service that we can be proud of and that our clients can depend on. We strive hard to provide our clients and their animal companions with a relaxed and stress free healthcare experience in their familiar home environment. We also want to provide the best quality care that will ensure an optimal level of health and wellbeing. I want to thank all of our amazing and loyal clients and pets who we have been privileged to get to know over the past two years. You are the best!! I look forward to many more years.